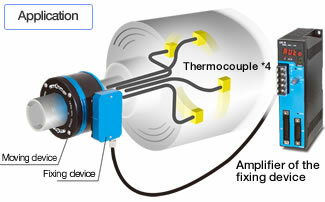 ABSOCOUPLER Thermocoupler data transmission type is the non contact and true wireless transfer system for real-time temperature measurement of heating roll. head of the moving device, thus it is easy to plug or unplug the thermocouple. contact, and the analogue signals output from the amplifier of the fixing device. The data transmission head can be directly mounted to the shaft of the heating roll. the data transmission head of the data transmission. communication can be monitored by the amplifier's panel of the fixing device. In addition, an error state can be detected and output by the contact point.